Mike Frank didn’t want to go to war and who could blame him. He would rather be on a dance floor with a gorgeous blonde than behind a European hedge grove praying a bullet wouldn’t find him. Cannon fodder was the last thing he aspired to, but he also had a strong sense of being Jewish and the importance of standing up to the Nazis. Mike’s WW II experience is akin to Forest Gump’s run through history. He was near the crossroads of the action with a behind the scenes view. His guardian angel was a loyal companion, keeping him out of the fray and although he carried a carbine, never had to fire it. He was close enough to glean the good things wars can teach men— the value of brotherhood and the ability to adapt to chaos. He came out of the war smarter, more sophisticated and bolder than when he went in. It laid the foundation for Mike’s next 60 years and those years probably wouldn’t have been as sweet if it weren’t for the seasoning the war provided. 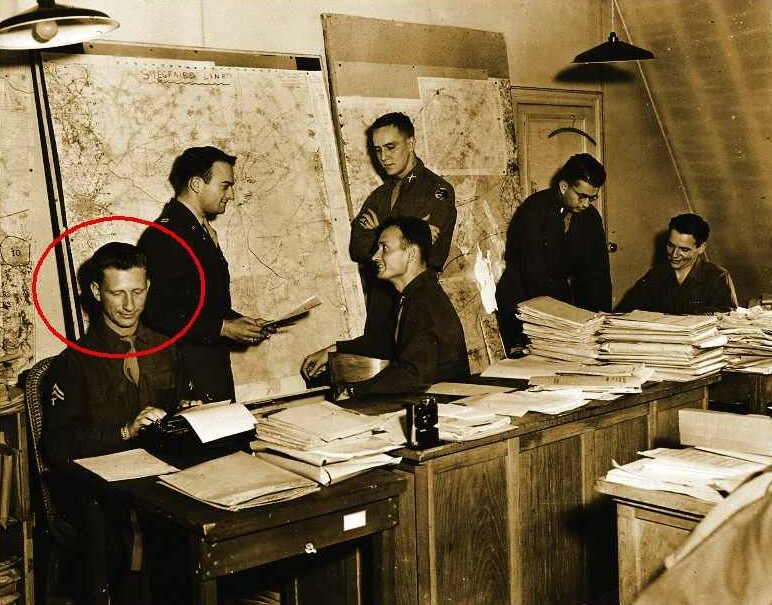 He saw the war from the battlefields of Belgium, on the ruined streets of Germany and from opulent Paris chronicling the war effort as a stenographer in the Army’s Historical Division. His visits to Paris’ great museums and concert halls was his college education. 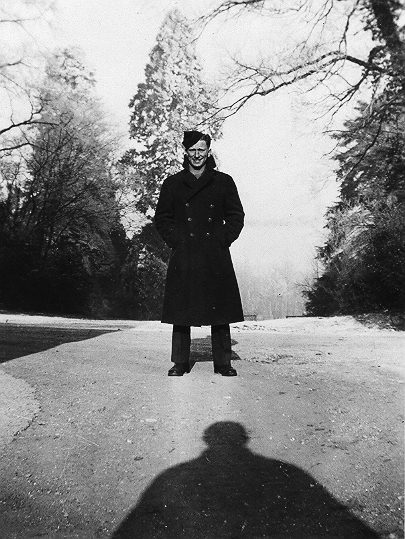 Unlike most soldiers who couldn’t wait to get on a troop transit ship and get home, Mike was torn between staying in Europe where he had grown intellectually and socially. His post-war decision would shape the Frank clan for decades. Mike grew up in a Cleveland orphanage and among the life-saving skills he picked up there was typing and stenography. Blessed with god given – hand eye coordination his ability to type accurately fast and take flawless hand written notes would put him in the steno pool behind a typewriter and not a fox hole behind a carbine. 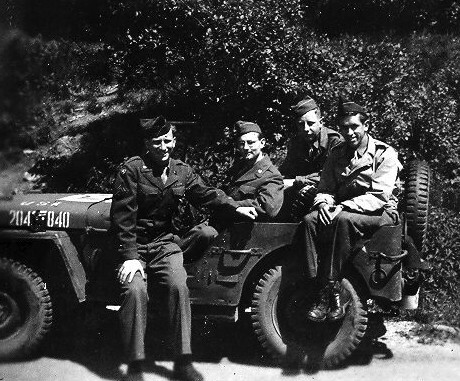 Unlike the nearly 400,000 1940s conscientious objectors who either feared war or were against it on moral grounds, Mike didn’t consider leaving America for Canada or becoming a “slacker.” He knew the Germans were evil and wanted to stop the slaughter of the Jews but his abhorrence of violence kept him from enlisting. Instead he took a job in a defense plant in Los Angeles to avoid combat but by 1944 the draft board was running out of fresh bodies and he got the letter to report. He was living with a self-absorbed aspiring actress, a blond bombshell named Genevieve, but broke off the relationship, sold his true love; his 1939 Chevy sport coupe and headed to Ft. Knox for basic training. The brutish Sgt. Hruska was waiting for him there. The sergeant schooled him, but didn’t break him. “Sgt. 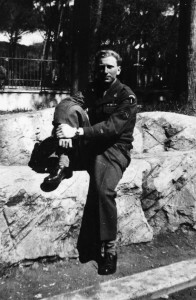 Hruska was mean spirited, vindictive and took great pleasure in arbitrarily making the men he didn’t relate to miserable,” Mike writes in his WW II memoir, “The Chairborne Invasion.” The sergeant detested Mike for two reasons. He was a draftee and not an enlisted man plus he had tested 163 on an IQ test which put him in the genius category. The IQ test was a fluke, according to Mike, as he guessed at most of the multiple choice answers, but it helped him gain special status that eventually put him in the steno pool. After three months of basic training, Mike along with 18,000 replacement troops boarded the Queen Mary in New York and sailed for England. The luxury liner was designed for 1,800 well-heeled travelers, but Uncle Sam’s retrofit turned a two-person cabin into a nine person claustrophobic sardine can. The five day trip was hellish with constant fears of German subs, but Mike distinguished himself serving on the vomit patrol cleaning up the seasick soldiers multiple heaves. 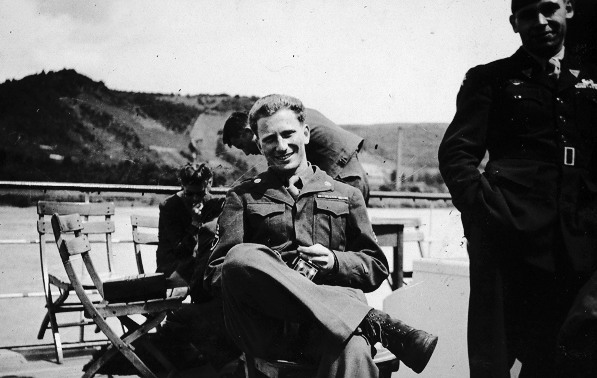 Once arriving, Mike was one of 10,000 troops camped out waiting to be sent to the front lines as replacements for the dead and injured who had fought their way from the beaches of Normandy into Belgium. 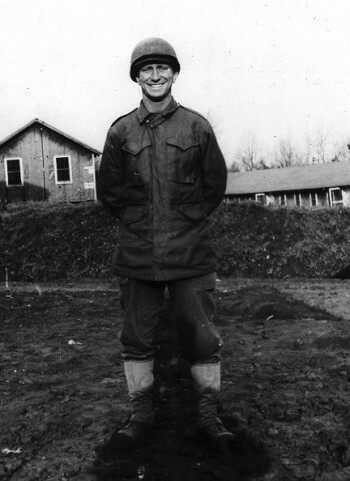 A call on the camps’ loudspeaker altered his war experience and his life. A lieutenant in a jeep was there to pick him up and took him to meet his new boss for his new assignment with the Historical Division. His “genius” IQ and his steno skills were noted by the brass and he was joining an elite organization. The Army never got a clear historical record of WW I and tried to piece it together in the decades following. It wanted to make amends and chronicle WW II in real time with a 200 man unit to record the day to day events as the war unfolded. Mike was assigned to a University of Chicago professor, now a lieutenant, who was to conduct interviews with the men at the front lines. 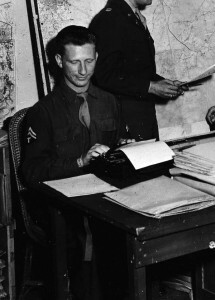 Mike was assigned to be his sidekick typing up the information and making the field notes. Casualties and battle details were all part of the information gathered. They interviewed hundreds of soldiers from grunts to the generals from the Second Armored Division who my dad fought with. Who knows? Mike and his CO could have interviewed my dad. When the daily field work was done, Mike and his CO would retreat behind the lines in their jeep and stay in the best accommodations available – often the homes of the fleeing populations. Mike knew he was lucky. Many of the 10,000 GIs he left behind would go to the front lines and thousands would perish at the Battle of the Bulge. In his novel, “The Chairborne Invasion,” Mike depicts his travels through Germany where he saw the ravages of war and where he met every day Germans. Mike writes, “It was incomprehensible how these same ordinary people could have been complicit in the atrocities attributed to the Germans.” He knew it would give birth to a collective guilt that would burden them for generations. He was fully aware that glory in war happens only in retrospect that history is told by the winners and that wars, right or wrong produce suffering – especially for the losers who have to live with the ignominy of defeat. 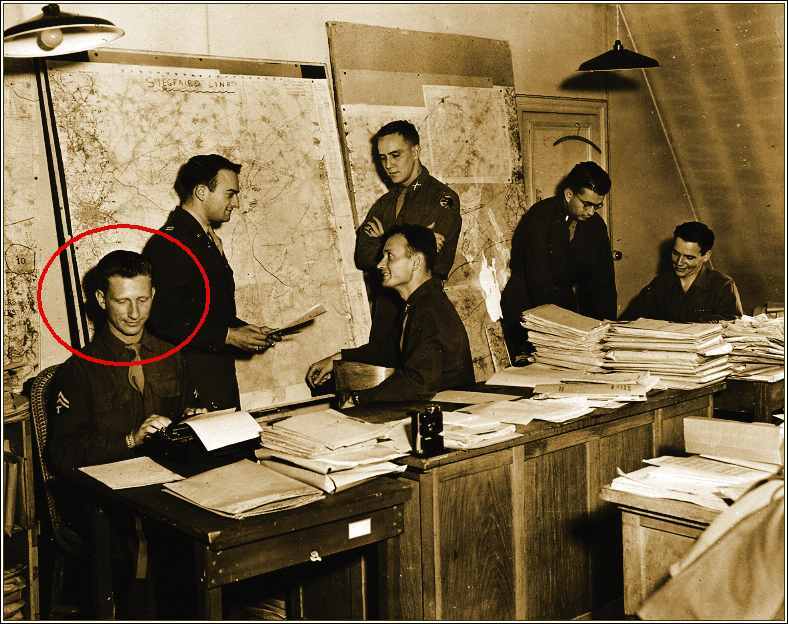 In the wars later stages Mike was transferred to Paris where the Historical Division was housed in the former Gestapo headquarters. He worked and lived in an opulent chateau on Avenue de Foch near the Arc de Triomphe and didn’t miss the irony of a Jewish orphan occupying space the Nazis had been forced to surrender. 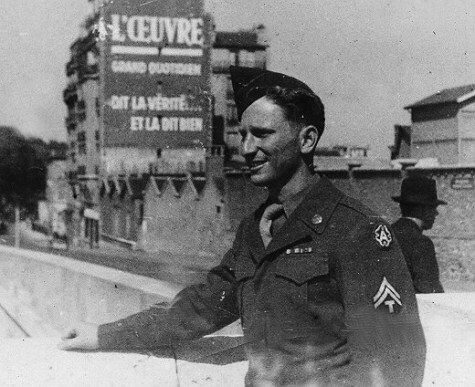 After the war ended Mike was offered a cushy job to stay on in Paris for a year at civilian pay. He was intoxicated by Paris, its museums, dance halls and love-starved mademoiselles. He was exposed to a rogue’s gallery of characters that included French painters, assorted GIs on the make, and young women displaced by the war. He ingratiated himself with French families and this immersion heightened his people skills and expanded his world view. He could have easily stayed, gotten married and Eddie and Laurence Meyer would have turned out to be beret-wearing, wine drinking Frenchmen. “He led an incredibly charmed life, but he got swept up in the homecoming fever and it was with a great ambivalence that he went back to the U.S. He was rootless and had no family. He later regretted that he passed on the opportunity,” Laurence Meyer said. But the war had given him the self-assuredness to embark on a new opportunity, a journey to South Africa where he would meet a beautiful young woman while walking down a Johannesburg street, and start a new life with her. The war had given Mike the confidence to be the kind of father that would allow the Frank boys to be the fearless adventurers they turned out to be. Over the years Mike became a disbeliever in Uncle Sam’s military might and feared for his sons during the Vietnam era. But it was Mike and the millions of other GIs service during WWII who created a different world for their children to be free in. “He gave us a free pass to be or not be a soldier and that is all part of our inheritance,” concluded Laurence.